SysToMath Aids C++ Library (stmaids). 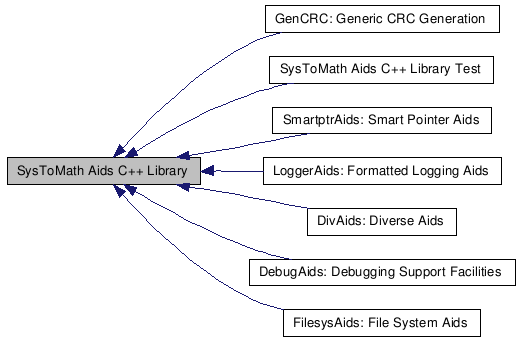 The SysToMath Aids C++ Library consists of several library objects providing various macros, functions, function templates, classes and class templates facilitating some basic computational tasks. Central include file for SysToMath Aids C++ library. Collection of some debugging support macros and functions. Collection types, functions, function tempates, classes and class templates providing endian handling, buffer handling, byte iterator ranges, integral ranges, integral sets, condition variables, scoped locks and string handling support. Collection of some file system related classes and class templates for path handling, bash-like file name globbing, POSIX-conform file spec expansion, and file and file range input scanning. Declaration of the class template stm::crc used to generate cyclic redundancy check (CRC) remainder polynomials of template type RemPolT over buffers of byte-like objects. Declaration of class templates for formatted logging on an output stream and on the console. Declaration of class templates for smart pointer aids. Demonstration of the usage and tests of the implementation of the SysToMath Aids C++ Library stmaids.